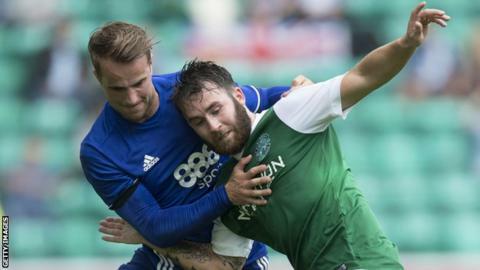 Head coach Neil Lennon has confirmed Hibernian's interest in signing Birmingham City forward Andrew Shinnie. Scotland cap Shinnie, 27, spent the end of last season on loan at Rotherham United. "We have spoken to the club and we have spoken to the player," Lennon told BBC Scotland. "There is no guarantee it will get done but we have made our interest known so we are hoping something may get done in the next couple of days." Former Rangers youth player Shinnie moved to Birmingham in 2013 after two seasons at Inverness Caledonian Thistle, with his sole international cap coming during his spell in the Highlands. He has over 180 senior appearances to his name, and 31 goals. "He is a quality player," added Lennon. "I have always liked him. I liked him at Inverness. "He has gone down and had a very good time at Birmingham. He is available and when a good player becomes available and is within our budget we will look at it. "He is a good athlete in terms of his physicality. He gets about the pitch well and has a goal in him."